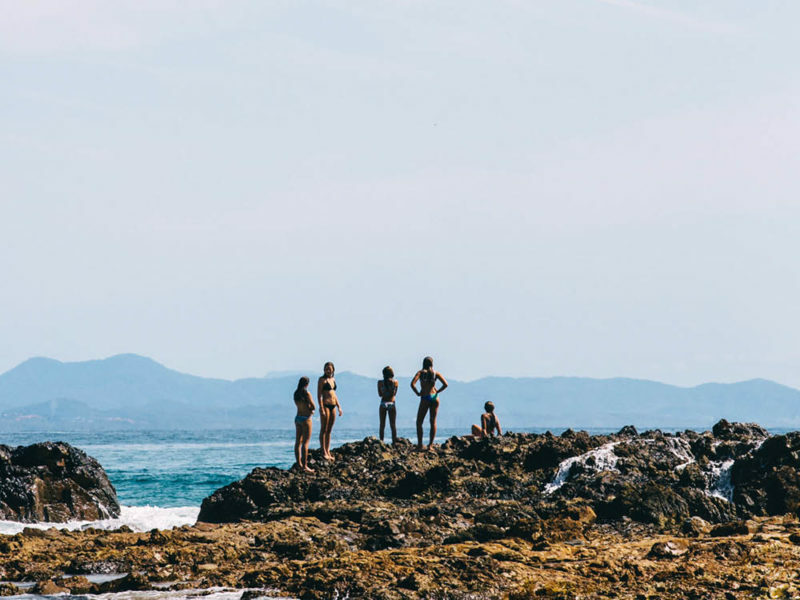 There is so much more to Byron Bay than just the beach. 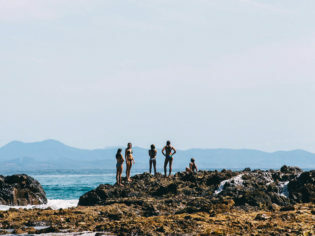 It may be loved for its beaches and chilled vibes but Byron Bay has plenty of other treasures just waiting to be discovered. From Main Beach, where surfers catch waves at the Wreck, to Clarkes Beach, Wategos and beyond, the Byron coast provides waves and beaches to suit most wishes. There’s the Pass, where longboarders mix it with beginners. Beyond, Tallow Beach, Lennox Heads and Broken Head. And then there’s our family’s secret beach, reached via a dirt road and an unmarked track, where we can have a whole cove to ourselves, with only a few surfers in the distance and some divers snorkelling off the rocks. But when the waves have worn you out, or if you’re up for some exploring, there is so much on offer within half an hour’s drive. Cape Byron Distillery is a short drive outside of town and surrounded by lush rainforest. A gin distillery, set on a macadamia farm surrounded by rainforest, serving gin-based cocktails –what a perfect place to start. Cape Byron Distillery is less than a 20-minute drive from Byron and is producing some of the best-tasting gins in the world. Both their Brookie’s gins have taken out world gin awards at the 2018 San Francisco World Spirit Competition. Brookie’s Dry Gin has 26 botanicals, many sourced from the local rainforest, while the ‘Slow Gin’, made in the style of an English ‘sloe’ gin, has a distinctive pink colouring from the native Davidson’s plum used in its making. Gin lovers should settle in at Cape Byron Distillery and order a selection of their gin-based cocktails. Try the Watermelon Spritz, made with Slow Gin, watermelon crush, lemon syrup and herbs. Not only refreshing, the Slow Gin has a lower alcohol content, making it my new go-to drink for summer. The family-run distillery is open for tastings and distillery tours on Fridays, Saturdays and Sundays (bookings essential). The luxurious Byron at Byron resort isn’t just for the guests to enjoy. You may not be staying at the Byron at Byron resort, but you can still visit this restful and stylish place for drinks, food, yoga, day spa and pool access. A drink on its poolside deck was not out of our reach, and the dinner menu looked very tempting. Wander off through the 18 hectares of rainforest while friendly staff mix up an aperol spritz, a whisky, or a craft beer, and come back to relax poolside on the cosy couches. The day spa offers treatments and massages, and yoga is on offer to guests and locals alike at 6.45 am on Friday, Saturday, Monday and Tuesday mornings ($25 per session or $150 for a 10 pass). The ‘Morning Rituals’ package includes a buffet breakfast, a yoga session, massage, access to the day spa and pool and there is also a ‘brunch’ option, for those who prefer to lie in. Bookings can be made through the Day Spa on 02 6639 2110. Brunswick Heads, just 15 minutes from Byron and set on the Brunswick River, is home to the famous Hotel Brunswick. If you have the opportunity to be there on a Sunday, make the most of a pub with a huge beer garden and a solid list of gigs. Last time we were there, we danced in the rain with a heaving mob to a world music-style techno band who were just back from touring Japan. This place goes off! The town is now also home to one of the most impressive small restaurants in Australia. Fleet was recently awarded two hats in the Good Food Guide 2019. Josh Lewis and Astrid McCormack started up the 14-seat dining room after both having clocked up impressive notches on their CVs; chef Josh worked alongside Shannon Bennett for years, and spent time at Mugaritz in Spain, while Astrid ran Loam on the Bellarine Peninsula. Fleet offers diners a chef’s menu filled with subtleties and inventiveness. Think: oyster served with frozen sour cream and grated chestnuts; roasted celeriac, soured cream and bottarga; or a dessert of crispy onion and tarragon paired with liquorice and dandelion ice-cream. Astrid’s small and carefully curated drinks selection introduces the diner to wines from boutique organic winemakers or brewers from around the world. If you can’t get a booking, don’t be deterred by the months-long waitlist. It has come through for us twice now, due to cancellations on the day. For those unable to get a seat at this highly sought-after joint, Ethel, owned by the same crew, serves up salads in huge earthenware bowls for breakfast and lunch. You’ll also find take-home meals, deli provisions and coffee and cakes. And the foodie options in Brunswick Heads have just expanded even further, with the January 2019 opening of Josh and Astrid’s new Mexican restaurant, La Casita. La Casita is still operating a little under the radar, offering dinner from Thursday-Monday and weekend lunches. For the moment, bookings and information can be found on their Instagram page. The Farm is committed to sharing their passion for sustainable farming with visitors and locals alike. Under 15 minutes from town, The Farm is a former 30-hectare dairy farm that now hosts a community of micro producers committed to a philosophy of growing, educating and sharing their passion for sustainable farming. It is home to cattle, chicken, fruit and veggie gardens, and a produce store and restaurant, Three Blue Ducks. The restaurant is open seven days, with dinner Fridays to Sundays, but also welcomes people setting up rugs or finding a table within the grounds and can supply hampers at $100 to suit two to four people. Stroll the farm grounds and check out the animals while you’re there. Stay for a meal at The Farm’s Three Blue Ducks restaurant and leave with your own bag of produce from the store. Byron Arts and Industry Estate is only three kilometres from town and is home to surfboard makers McTavish, design studios, artisan potters, coffee houses including AllPress, fashion outlets, homewares, Stone and Wood Brewing Company, candle-makers, teahouses and more. 100 Mile Table catering runs events using local produce from the Northern Rivers region, but they also open as a cafe from Monday to Friday, 7am–2pm. Just outside the Arts and Industry Estate, a new addition to the local residential and retail hub is the Habitat precinct, where you’ll find homewares and design shops, and a new foodie favourite, Barrio, with its ‘Feed Me’ menu at $49 per head, for a minimum of four people. Menu options include chargrilled pork belly and charcoal chicken, with omelettes and corn bread for breakfast and hot sandwiches and sides on offer for lunch. Barrio is open Monday to Saturday. Newrybar is a tiny little town, about 25 minutes from Byron Bay, but Harvest has made a huge mark on the food scene of the area. Take dinner on the verandah, or have whiskies and cocktails by the fire. With its bakery/cafe next door, you can stock up on smoked meats, cheeses and fresh salads, or stop on the deck and enjoy good coffee or juices. Across the road, Newrybar Merchants has a cool collection of tenants ranging from bookstores to furniture-makers and artists. For those who like to search through collectables, and browse locally made jewellery and furniture, Luther & Co also has a fine range. For fashion, the dependable and inspiring driftlab has sorted me for many a summer. Bangalow, 20 minutes’ drive from Byron Bay, is another great stop for fabulous food and artisan products, with plenty of eating and shopping options along the main street. Established in the 1880s, Bangalow was originally a camp for timber-cutters, and the pub has a lovely ambience. The town has a billy cart festival in May, a bluegrass festival in August and there is an annual agricultural show in November. Monthly markets are on the fourth Sunday of each month, and farmers’ markets are on every Saturday from 8am–11am. Yes there’s more to Byron Beach than the waves. But to be honest, that’s what keeps us coming back. I just can’t tell you where my ‘secret beach’ is, because maybe, just maybe, we can keep that as our own family hideaway. Byron Bay Bluesfest, 18–22 April 2019 and Byron Writers Festival, 2–4 August 2019 are highlights of Byron’s cultural events calendar. Visit www.byron-bay.com/events/ for more. If you don’t have a car, the local bus service, Blanch’s, can take you around the Byron Shire, or try the local taxi service on 02 6685 5008.